Peter Waldner's wife, Anna Magdalena Folmer -she died in Tacoma, Washington in 1930. She came to St. Paul, Minnesota from Grossjetscha in 1905. (I found her on the David Dreyer ships list). She was born in Grossjetscha also. 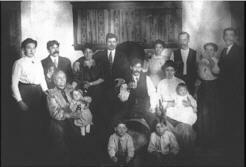 My grandmother's family - the Waldners. They were all born in Grossjetscha. The photo was most likely taken in St. Paul, MN. Note the beer barrel in the photo. Back Row, left to right: Mary & John Waldner, Madalena Waldner Gangl & Andrew Gangl, Ann Waldner & Fred Hanson, Kate Waldner & Anton Krummer. 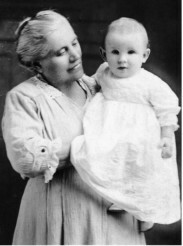 Middle Row, left to right: Anna Magdalin Folmer Waldner (O Ma Ma) holding Joe Waldner, Frank & Margaret Waldner holding baby Margaret, Anton Waldner & unknown boy.